Immunosuppressants: cyclosporine, tacrolimus Source: From Ref. 140.
value for Fsystemic. It is also important to note that these values are associated with large intersubject variability. A complicating factor, however, in this interaction is that many compounds that are substrates for CYP3A4 are also substrates for P-gp, the efflux transporter protein that resides in the membrane surface of the GIT enterocyte. This transporter was noted in a previous section that discussed the transport process. There is evidence to suggest that the drug interaction with grapefruit juice also involves inhibition of this efflux transporter (137). Both CYP3A4 metabolic inhibition and P-gp efflux transport inhibition will result in increased drug bioavailability. It is possible that these two mechanisms are acting in tandem in an attempt to limit foreign compounds (such as drugs) from entering the systemic circulation. A recent study (140) has also indicated that these interactions occur in elderly patients. This is especially important since most interaction studies are typically performed in young subjects, yet the elderly are more likely to be taking the drugs that undergo these interactions. Table 8 lists drug examples in different therapeutic categories that are known to participate in this grapefruit juice interaction (140). It should be recognized too that these compounds will also interact with any other drug (e.g., ketoconazole) capable of inhibiting CYP3A4 and/or P-gp. The illustration mentioned earlier should offer a clear caution that components of food may interact with drugs, resulting in substantial positive or negative therapeutic effects. As will be noted below, this principle also applies to so-called dietary supplements, including botanicals used for the treatment of numerous medical conditions. In addition to food- or nutrient-based interactions in the metabolism of drugs, it has become quite clear in recent years that so-called dietary supplements, including botanicals have the potential to participate in drug interactions. The latter observation has special relevance because of the extensive use of such products worldwide (ca., $15 billion/yr in the United States alone), their easy commercial availability (no prescription required), and their common use with prescribed drugs. Furthermore, many people consider such "natural" products to be safe and free of any adverse effects (it should be pretty easy to recall many poisons that occur in nature and are, therefore, natural). There are several recent examples of botanical drug interactions, which should serve as a warning that we have just begun to see the tip of the iceberg. This should not be at all surprising when one considers the large number and variety of chemicals (phytochemicals) present in botanicals that are ingested for medicinal value. St. John's wort, which is extensively used for the treatment of mild depression, has been shown to induce intestinal P-gp and intestinal and hepatic CYP3A4 in humans (141). That mechanism explains the significant reduction in cyclosporin and anti-AIDS (e.g., indinavir) plasma concentrations. It is likely that similar effects will be noted with the compounds listed in Table 8 (however, the effects noted in Table 8 are in the opposite direction of those seen in the presence of St. John's wort). The GI microflora provides another potential site for drug metabolism within the GIT, and it has received some attention. In normal subjects, the stomach and proximal small intestine contain small numbers of microorganisms. 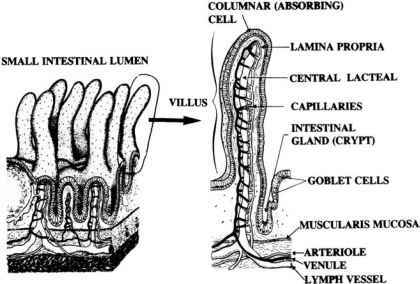 The concentrations of these organisms increase toward the distal end of the intestine. A wide variety of aerobic and anaerobic organisms are present in the gut. The microflora, derived primarily from the environment, tend to adhere to the luminal surface of the intestine. Within an individual, the microflora tends to remain rather stable over long periods of time. The primary factors governing the numbers and kinds of microorganisms present in the tract include the activity of gastric and bile secretions, which tend to limit the growth of these organisms in the stomach and upper part of the GIT, and the propulsive motility of the intestine, which is responsible for continually cleansing the tract, thereby limiting the proliferation of microorganisms. Gastric atrophy permits increased numbers of microorganisms to pass into the small intestine, and reduced intestinal motility results in overgrowth. Studies conducted mostly in animals, indicate a wide range of primarily phase I metabolic pathways. Various drugs that are glucuronidated in the body are secreted into the intestine via the bile, and these are subject to cleavage by bacterial glucuronidase enzymes. The cleavage product may then be in a form available for absorption. Various drug conjugates may be similarly deconjugated by other bacterial enzymes (e.g., the glycine conjugate of isonicotinic acid). Although some drugs may be rendered inactive, bacterial metabolism of other drugs may give rise to more active or toxic products. The formation of the toxic compound cyclohexylamine from cyclamate is an example (142). Salicylazosulfapyridine (sulfasalazine), which is used in treating ulcerative colitis, provides an interesting example of a drug whose metabolites represent the active pharmacological species. The parent drug is metabolized to 5-aminosalicylate and sulfapyridine. In conventional rats, both metabolites and their conjugates appear in urine and feces. In germ-free rats, however, the metabolites are not excreted. This suggests that the intestinal flora plays a role in reducing the parent compound and formation of the two metabolites. If this is the case, factors influencing the population and types of intestinal microorganisms may in turn influence the absorption and effectiveness of the drug. For example, concomitant antibiotic therapy, by reducing the population of microorganisms, may prevent the parent drug from being metabolized.